A flat coastal procession past white sandy beaches and inviting bays, a day of s​ol y playa if you watch it all on TV. It’s all a warm-up for the double ascension of the Puig Llorença with its steep slopes and another Made-For-TV stage finish. Stage 8 Review: Julian Alaphilippe infiltrated the day’s breakaway and Rafał Majka tried to shake him off his tail on the final climb of Xorret de Catí but couldn’t and Alaphilippe duly won the stage, an almost inevitable outcome given the scenario yet an enormous relief for the Frenchman who has sat out much of his season because of a knee injury. Behind Chris Froome and Alberto Contador traded moves and dropped all the others, confirming Contador’s stomach troubles in Andorra have passed but leaving us wondering how the race could be if this hadn’t happened. He and Froome appear to be a level above the rest for now with Esteban Chaves close in terms of climbing performances but there’s always Logroño, the time trial on Stage 16. The Route: Stage 9 is a copy of the 2015 Vuelta’s stage 9 and the only difference on the route is one of spelling, then it was Jávea for the intermediate sprint, today it’s Xàbia as the Vuelta makes more use of local languages and nomenclature as devolution hangs in the air. 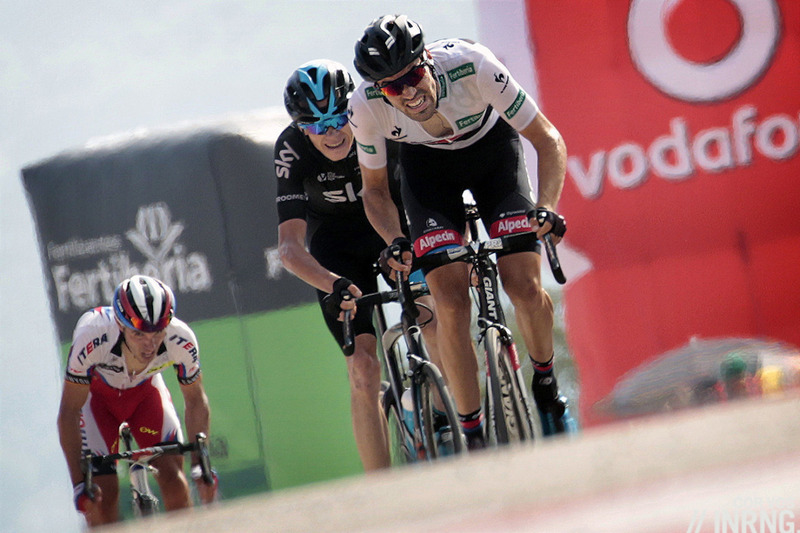 It was the day Tom Dumoulin and Chris Froome duelled, the Briton surging with 300m to go only for Dumoulin to sprint past in the final moments (pictured). It’s another stage where the action comes late, 120km warm-up to the day’s difficulty, the Puig Llorença, 3.2km at 9.2% but crucially with some steep 15% sections. The race graphic above says 22%. In 2015 it said 19% but the slope is more 15% on the steep parts. Either way it’s enough to rob momentum and make it a very hard climb. The Finish: the same climb but different. the climb up the Puig Llorença again but with the final 750m they fork left on a new road to the finish line, 4.1km at 8.9% and the stretch to the finish line includes more high teen gradients. They’ll be catching the riders across the line. The Contenders: a breakaway or the GC teams? Let’s say the GC contenders fight for the stage win today because it happened this way the last time and also because the flat course invites teams to control the race and if Team Sky want to contain the race then Trek-Segafredo might help knowing Alberto Contador wants a stage win and this is a perfect chance. Chris Froome can finally get that win while the usual suspects get a chainring too. Weather: warm and sunny again. TV: It’s on La1 in Spain and Eurosport around much of the world and often on the same broadcaster you watch the Tour de France on. The finish is forecast for 5.40pm CEST. Daily Díaz: Miguel Hernández (1910-1942) was a Spanish poet and playwright. He was born to a poor family in Orihuela, and during his childhood worked as a goatherd. He managed to get some education, and began writing in the 1930s. Those were intense times for Spain, with the Second Republic unable to prevent the explosion of the Civil War in 1936. Hernández was a member of the PCE (Spanish Communist Party), and after Franco’s victory in 1939 he was captured. He died in prison in 1942. A symbol of the Spanish culture, every year la Senda del Poeta (Poet’s Path) takes place. It is a three-day walk (about 20 kms per day) from Orihuela, where he was born, to Alicante, where he died. A profane pilgrimage, if you wish, attended by Spanish teachers, their pupils, and communist and republican nostalgics. Yesterday was an eventful one. There was the Warren Barguil saga, never easy for an outsider to really know what happened but it does seem as if Warren Barguil’s ego might have become rather over inflated. Pro cycling is an odd combination of team and individual sport, if the individuals wont sign up to the team then it makes difficulties for all. Not sure this bodes well for his new team. Cannondale appear to be on the point of closing, a real shame when they have been pretty successful recently. Then there was the race. Barring the usual incidents and accidents it is becoming more and more difficult to see anyone challenging Chris Froome. One chink in his armour might be that his team, especially Ian Stannard and Christian Knees, must be getting tired in the heat. Can they continue to pull on the front every day? If one of his rivals manages to smuggle themselves into a break will they be able to pull it back? The picture from last time was apposite, it is likely that Chris Froome’s biggest rival isnt here but training for the TT at the world championships. The weather forecast for this afternoon has possibly thunderstorms for the back end of the race. Whilst it might be a welcome shower for many, it could make the descents dicey / punctures. I can’t imagine the Spanish authorities are sweeping some of these minor roads ahead of the racers? Barguil’s exclusion wasn’t clear, it seems because he refused to work for Kelderman but it’s not made public, just a general suggestion he wasn’t playing part of the team although Barguil said it was because he didn’t sit up to help pace Kelderman back after a puncture. Fingers crossed for Cannondale/Slipstream. They’ve had success in the Tour of late but have been a pioneering team in many other ways but the nature of the statement is clear, they’re in real trouble and having announced things the riders are free to move which makes things worse, eg a couple of star riders might decide to move elsewhere which means what is left of the team is less attractive for a new sponsor, creating a vicious cycle. Not sure about the rules surrounding it but Cannondale dropping down to pro conti, safe in knowledge they will get an invite to at least one grand tour? Others can correct me if I’m wrong but I think a lot of riders have a clause in their contract about remaining at World Tour level. It’s fine if you’re, say a French team with a French sponsor who will get automatic invites to all the big French races, but an international brand like Cannondale would want international exposure, in Europe, America, Australia, China etc. The strange thing about Barguil’s refusal to sit up is that if he’s not going for GC – and he wasn’t going to win that stage – then he doesn’t have any reason not to sit up. What could be in Sunweb’s mind is that Barguil was clearly so much part of a team effort at the Tour – he benefited from colleagues’ help (Matthews for instance) and indeed provided it in return. It is an oddity that individual riders get the glory from team efforts. I didn’t see that so-called team effort on the Izoard. I gather that Barguil and Kelderman have a long history of rivalry and dislike. Keldermans arrival was one of the triggers for Barguil to ask to terminate his contract early. After Barguil refused to help Kelderman and pushed for the line, there seems to have been a bit of a punch up. If so, there is only one way onwards… Who do you support, the guy who is leaving, or the guy who is staying? Silly boy WB. I wonder how he would / will feel if any of his new teammates prefer personal glory not supporting the designated leader, ie. him? I’m troubled by the Cannondale situation. Given their recent success it’s worrying that a major sponsor should pull out at this stage of the game. They just recently announced the Oath deal as well, which I’d though was to become title sponsor and secure the future of the team. It’d by a crying shame to see JV’s vision go up in smoke after all these years. A little hard to understand. Cannondale and Drapac seem to be continuing, Oath have joined, yet JV claims to need $7 million to continue. Too many contract improvements on assumption of new sponsor now fallen through? It’s getting late for riders to find new teams, and is the solution more pro-conti teams assured of places in the (national) races which most interest them? Uran to Trek? It’s the type of experienced rider they like to contract, and were having difficulties finding a replacement for Contador. I won’t cry if cycling finally gets rid of hypocrite Jonathan Vaughters. This is the man who said he’d fold his team if anyone on it ever doped. Tom Danielson did. Get out! I won’t miss Vaughters. He’s another ex-doper who says he takes responsibility for his actions…but in the next breath blames what he did on being young, on the culture in cycling at the time, on influential people around him, and so on and so on. He employed many ex-dopers on the team and then claimed that he would shut the team down if anyone tested positive for doping. But then one of those “ex” dopers–Tom Damnielson–tests positive in 2015 and suddenly Vaughters backs away from his years of tough talk. The guy is a hypocrite, the teams he has run have consistently under performed, and year after year he has struggled to keep his team budget out of the red. Hopefully the departure of Vaughters will open up the door for a pro-conti team that is less mired in drama to step up to the pro tour level. He never actually said this, it seems to be one of those ideas that has entered a collective conciousness by accident. Even if he had said this it would be dumb, to stop an entire team because one idiot goes rogue should not be automatic, a pledge but something for review and consideration, no? With wind gusts of up to 50 kph from the NE (on average head-on, but probably from the side quite frequently), I wonder if the flat coastal roads could inspire one or more teams to break up the peloton before the climbing starts. Perfect way to use riders like Stannard and Knees (Sky), Terpstra, Declerq, Jungels, Trentin and Lampaert (Quick Step), and Theuns, Irizar, De Kort and Stetina (Trek). I’ll *exceptionally* try the mobile way (being away from my laptop…) just to note that if these finales were really «made for TV» as you write, well, the people who decided it didn’t even bother checking TV results. I don’t have this edition’s data yet, but in the previous ones this kind of stages more than proved itself to be an audience failure, *unlike* long mountain marathons (typically) and, more recently, those short stages rich of hills or mountains all the way through. Very nice race until now although the best *should* be yet to come (this is the most Vueltish weekend, and the best stages until now were clearly the *less* Vueltish ones); sort of confirms the «generational void» theory (but there’s still a good way to go and eventually change that impression). Froome started strongly as it could easily be foreseen. The only doubt is if he’ll be able to keep this form level through the three weeks, which would be quite surprising in absolute terms (hence his aggressive and expensive attitude, I guess), but could well happen in relative terms if the rivals whith a different prep fail to build up a better condition. Anyway, he’s going to get a comfortable gap by then and the team looks strong, too. I guess I won’t be around for the debate, please excuse me in advance! To keep you up to speed gabriele: Froome won stage 9. He now leads the overall, points and combination competitions. (Sadly only 3rd in the mountains classification.) Vincenzo has yet to show himself but is so far demonstrating my theory that he cannot beat Froome. I hope you are enjoying yourself whatever you are doing. Made for TV in that the stages promise action at the finish. Re: cannondale. It is indeed very sad, moreso for the mid/lower level riders who may struggle to find a ride for next year now and who would feel it most financially. Sep probably interests me most. A lot of the bigger teams seem to have their classics squads in place, and he’ll be commanding a high salary which most teams will have allocated elsewhere. At 29 you now feel that this is his last chance to fulfill his potential. If Rowe is looking like he’ll be out for next spring, will sky take a punt? They likely have the funds to pick him up last minute and do look short of a classics leader. SVM to Sky would be interesting from a British perspective, although they still have Stannard who has a Roubaix podium and Omloop wins under his belt. You’re right they look short for Flanders with Rowe out and Thomas now focusing on GTs. I wonder if UAE or Bahrain will be tempted by SVM? I can’t think of any northern classics riders at either? Although I have a feeling I’m forgetting someone. Wouldn’t rule Kwiatkowski out of Flanders contention either. I can see him winning it one day. It’s looking more and more like a one-horse race. Might have been very different had Contador not lost 3 minutes, but then we’ll see how he is on longer climbs. A big shame, though, as he seems to be the only one who can challenge Froome: notable that on the last climb when Froome was on the back no-one attacked (not surprising, as most riders seem to compete for 2nd against Froome these days). How would it have been different? Is Contador dropping Froome? Let’s wait until stage 11 when its a proper mountain. Then let’s see if Froome leaves everyone for dead or if Contador still sticks. PS How come Contador, who was double digits worse than Froome in France, is suddenly his equal in Spain? Something of a form jump wouldn’t you say? What do you think it is that has lead to this increase in form? Well Contador fell down like 5 times in the Tour. A thing that a lot of people seemed to have missed when talking about Contador his results this Tour. A wasn’t sure that he would be good this Vuelta, but this form does not surprise me. We saw how he is on longer climbs in Andorra. Unfortunately. sometimes I get the impression from your comments that all race is matter of rider’s will. Have you ever considered capabilities are necessary too? On Cumbre del Sol they didn’t drop Froome cause they didn’t want it, because they couldn’t. If you don’t want to know why feel free to skip the rest of this post. For example, on that last climb Bardet and Carapaz attacked multiple times earlier on more steepest parts, but they blown up in the end. Accelerations on climbs required a lot more power than steady pace on the same terrain (human beings has not endless resources of energy, biologically speaking) and there’s repercussions on the body after each huge effort like that. In the end to be more fast than the others on climb is a matter of managing his own resources wisely. Another data must be acknowledge for everyone is there’s no draft effect below 22km/h (exception must be made in case of crosswinds and headwinds present) and there’s no way of faking on climbs. Yesterday Kelderman was fastest along 3,6km on Cumbre del Sol with 19,7km/h (according to Strava https://www.strava.com/segments/5270481?filter=overal). If you analyze his ride there were 3 segments of the climb with likely draft effect (at 400m mark over 600m at 25km/h, at 2km mark 200m at 36km/h and the last 300m to finish line with 23km/h) . Unfortunately Bardet and Woods didn’t post their rides yet and Contador and Froome don’t use Strava (publicly at least). You are talking about a different day, so your ‘data’ is not relevant. If no-one attacks Froome, no-one will beat Froome – especially as he is likely to take even more time in the time trial. If Froome is at the back of the group, maybe it’s worth trying to see if he has some sort of weakness that day – doesn’t have to be an all-out attack, perhaps just a slight lifting of the pace. Or they can all line up behind him and ride for 2nd. I’m sure the data supports that sort of riding. On the note of that “slight lift of pace” you mentioned, how do you know they haven’t done that? It’s difficult to tell on TV on such steep climb that you have a “slight lift of pace”. Maybe they tried and didn’t manage to dislodge Froome? Aside from finding the race entertaining, I questioned what the point is of this 3 week sun scorched slug fest? Most of the riders are out of sight to the tv audience at the finish, or even 10 minutes after! Its one rider at his peak versus one rider trying to relive past glories and not much more. Froome does seem to be a way ahead at this stage, but as you say, he looks at his peak now so where will he be as they climb the Angliru in two weeks time? That said, would be very surprised if Contador can last the distance on the longer climbs (I think that also may be the less salacious answer to his TDF form difference) and the others have plenty of form to make up and, by that stage, time difference as well. We will see! Look forward to it all unfolding! Is there a prize for solipsism in commentary? As flagged up by their official twitter feed, Quick-Step’s GT strike rate so far this year is worth a mention: 13 wins from 50 stages…26% win percentage! 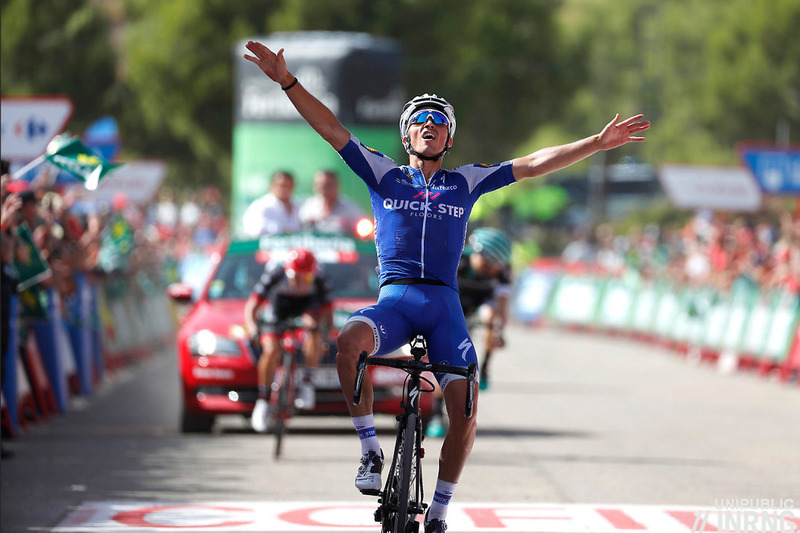 Clearly they put plenty of resource behind their sprinters at the Giro (Gaviria) and the Tour (Kittel) but they’ve continued to win at the Vuelta here too. Kind of a indication that Vuelta can be for Classics hard man too? I think it definitely suits the likes of Gilbert who used to get his win of the season here during his draught years. They’ve also managed top 10s in the Giro and Tour too, with De La Cruz maybe on for another here, as well as supporting multiple individual stage winners as you say. Highly impressive. Interesting to see Canondale in front of the peloton… seems the news had an impact on them. Also interesting to see Froome only with Nieve very early in the climb. Peloton was still 30+ and even after Nieve was droped GC group was quite big. Seems SKy on paper is stronger than on the hills. But was De La cruz already working for Froome? Cycling News’ ticker guy/girl had a dig at De La Cruz’s lead out. Nieve is a grand tour top 5 finisher and a Giro KOM winner. Hardly the worst climber in the world. His pace effectively stopped a single attack from a credible GC guy until he was done. Then Froome dropped everyone. This was never a climb for 30 second gaps. I am not saying Nieve is bad… not at all… I just mentioned that 1) Nieve was the only one left realy early, 2) even when h left, the group was still sizeble… usually when the last Sky men leaves, there is only a group of 6-7. That and/or Cannondale were positioning Woods for the climb where he paid off their hard work with 3rd on the stage and climbs to 8th on GC. One of those typical, exciting Vuelta stages with the sharp climb at the end – inevitably leading to a queue till the last few hundred metres and a sprint. Thrilling. The point of a race is to win. What an egotistical attitude to think that its to entertain you. I’m not criticising the riders, I’m criticising the course design. I don’t think it’s egotistical to suggest that the Vuelta organisers would be best designing a course that produced exciting racing. For most people, I would suggest that that would not be the Vuelta’s recent over-use of stages that are all about a final very steep climb. What an egotistical attitude to think that a comment is how you (and only you) imagine it to be.